Choice. It goes hand-in-hand with freedom. The freedom to choose how to access technology when, where and how you choose. Mobile learning technology gives us the freedom to take learning into our own hands. VoiceFirst technology removes the bind to the keyboard. Want to give your learners true freedom of choice to access training anytime, anywhere? We want to shift VoiceFirst technology right into the centre of the eLearning environment. VoiceFirst describes the action of using your voice to complete an activity – first. Voice-enabled devices such as Alexa or Google Home run programmable applications called skills, which allow voice-controlled interactions. VoiceFirst programmers use those skills to complete tasks. An end user then speaks to a voice-enabled device to get a response – avoiding a keyboard. VoiceFirst technology can also be used to replace chatbots – group and individual messaging services. These are available as apps on your device, with which you can communicate with your peers using only your voice. The benefits come from the speed with which messages are recorded and responded to, as well as the positive interactions that come from this more inclusive form of communication. You’ve probably got an Alexa who tells you the weather, gives you daily news briefings and plays your music library. Imagine you could actually get to grips with every skill that was relevant to you – how much easier your everyday tasks would become. Then imagine taking that capability and moving it into the workplace. 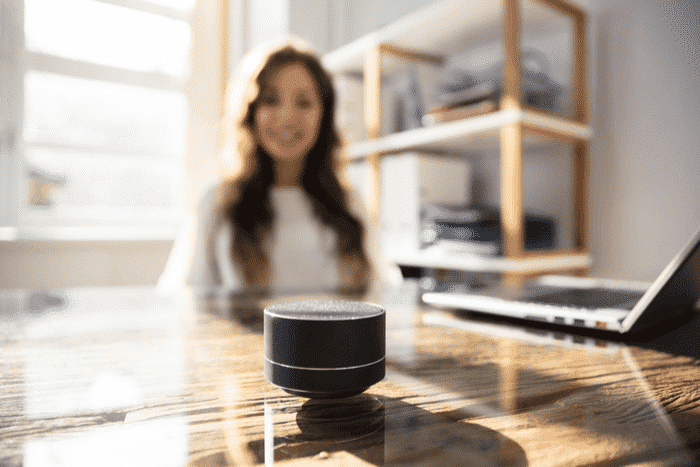 That’s where VoiceFirst is going – turning your daily tasks, at work or home, into a series of voice interactions that don’t require a handheld device. What does VoiceFirst Technology have to do with eLearning? This is the next leap. If online training authoring tools are going to keep up with workplace technology, then voice-enabled applications will have to be integrated. Social learning is becoming an essential part of learning strategy. Collaboration tools such as chatbots can easily be converted to VoiceFirst – giving learners a more personal experience. Groups can collaborate at all stages of learning to share their concerns and hopes, ask questions of experts, and quickly share on-the-job experience afterwards. When these tools are integrated with the LMS, learners don’t need to leave the learning environment – or take their attention away from the screen – to quickly pose a question. VoiceFirst enables a truly immersive learning experience that just feels more human. Most L&D organisations will be moving towards a full microlearning library, where resources are pushed to relevant learners and where learning can be completed on-the-go in manageable chunks. VoiceFirst sits neatly alongside any microlearning asset as it is, by its very nature, a chunk of knowledge shared and accessed when needed. VoiceFirst applications will allow users to access microlearning assets via voice-enabled devices – be that a web or phone app, or a smart device. The choice, then, really does sit with the learner. Do I want to access this microlearning audio resource from my car? If they have a voice-enabled device then they can participate in training on the way to or from work. The lines are blurring between “’home” and “’work” activities, and VoiceFirst technology facilitates the smooth running of your life. Is VoiceFirst technology really worth the effort? L&D organisations are learning, fast, that personal development must be the responsibility of the individual. Our role is to ensure that learners have access to the right resources, at the right time, in a method that suits them. In a world full of distractions, we are now focusing our attention right in the centre of an individual’s core distraction hub – their phone. mLearning brings multiple benefits in terms of ease of access and speed of delivery. But mLearning must compete with every other app on the device. Creating a VoiceFirst-enabled learning experience provides the learner with something exciting and engaging – that has the potential to transform how they do their job. Isn’t that worth investing in? Can I start small – and now? Get started with a VoiceFirst web app, like https://soundbran.ch. It’s free to access and you can test out the technology immediately. Use it within your L&D team to replace your messaging tool. Then, select a group of users who are about to complete a training course. Get them using the Group functionality of Sound Branch, to connect before, during and after the course. Collect and assess feedback and analyse scores and participation rates. Then, communicate your success. The best way to adopt VoiceFirst is to take the plunge – within a very short time, it will become your chatbot of choice. Role model VoiceFirst activities in your every day role and in willing training participants. Once you’ve won over your team, and have some champions in the business, take your case to your stakeholders with a view to expanding across the business and integrating with your LMS. By 2020, Gartner predicts that 30% of web browsing interactions will be done without a screen. That’s a huge chunk of our daily tasks that will switch from keyboard to voice. Your business will be using smart audio devices, so that your learners will already be comfortable with using VoiceFirst technology in the workplace. It’s a natural next step to bring voice to the online learning environment, where – after all – innovation moves at speed. As you transform your traditional online training strategy into microlearning, mobile learning and social learning – take the forward step to bringing VoiceTech, alongside all these approaches. It will become as essential as any other eLearning technology, so why not get ahead now and differentiate your online training offer? Sound Branch is a voice notes app that uses VoiceFirst technology to enable retention of learning within organisations, making the informal learning a formal process for L&D teams.